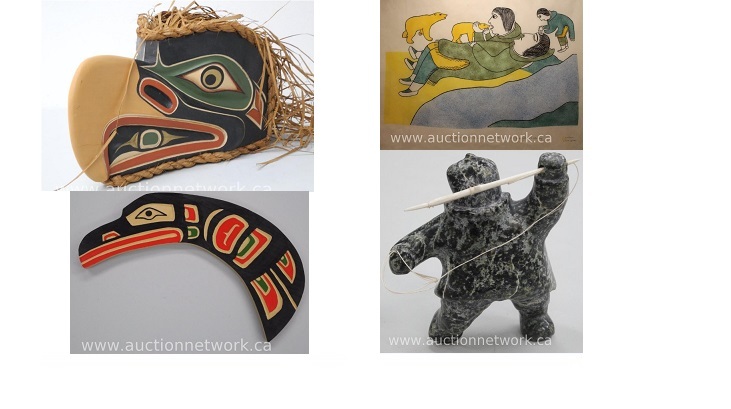 West Coast “HAIDA” Indian Art from B.C. Christian Morrisseau ‘Original Painting’ ‘The Vision’ Signed on Verso. Circa 2008. 57X48 Framed. Original Stone Carving by Inuk Artist ‘OOLOOPIE KILLIKTE’ of Lake Harbour – ‘Hunter’ with Spear and Rope. Gallery: $950.00. Size: 5 1/2H x 4 1/2 W.
West Coast ‘HAIDA’ Indian Art From B.C. Carved Cedar ‘West Coast Raven’ by ‘Wade Baker’ 13W x 4H. Signed. When the girl became pregnant, the father isolated her on a small island, but the dog swam over to join her. It would swim in from time to time with the pack saddle to get meat from the father. The girl bore a litter – some dog children, some children in human form . One day, feeling sorry for her, the father loaded the dog with stones, concealed with meat on top. When the dog swam out, he sank and drowned. Then the father used to take the meat over to the island. Next the angry daughter told her dog children to attack their grandfather’s kayak, but he managed to escape back to the mainland. He dared not go to the island anymore. Now in need, the girl put her dog children in a boot setting three straws for masts, and they drifted out to sea to become the ancestors of the white man. She put her human form children in the additionnal outer sole of a boot and sent them drifting to the land to give rise to the Chipewyan Indians. Then she returned home to live with her parents once more. One day while the father was away hunting, a kayak arrived and a fine big man called the girl out to go off with him; which she did. Stopping by an ice float en route, the kayaker got out and removed his sun goggles, whereupon the girl burst into tears for the man was punny, having only been sitting tall on a high seat, and had ugly eyes, a northern fulmar in human form. They went on to the bird’s sealskin tent where they lived together and had a child. But her sorrowing father set out in a boat to look for her and arrived one day while the fulmar was out hunting. He took her away in his boat. The fulmar, in bird form, caught up and swooping close it raised such a storm with its wings that the boat nearly capsised. In fear the father threw the girl overboard to her husband, but she clung to the gunwale. So he chopped off her first finger joints, and they bobbed up in the water as small seals. Again she grasped the boat’s edge, so the father hacked off the next finger joints which became bearded seals. Still the girl hung on, and the last joints were cut off, forming the walruses .Then she sank to become a spirit, the mother of the sea beasts. The father got home, but in remorse he laid down at the water’s edge under a skin, and the tide swept him out to join his daughter and the dog in a house at the bottom of the sea. Like people everywhere, the Inuit have songs for sad times and happy, for the end of a good hunt, to mock enemies and to greet friends. The human voice “throat music” is the primary musical instrument. Also, a flat, circular caribou skin drum, filled with pebbles provides a rhythmic accompaniment for these delightful tunes. To this day, proud Inuit gather around village fires for heart warming singing and dancing. It is an exciting and fulfilling part of Inuit life loved by everyone in the village. In the language of the Inuit; inukshuk means “One that looks like a person”. The inukshuiit are erected from stones to resemble a human figure. (Inukshuiit is the plural of inukshuk). Long before the Inuit had access to rifles and ammunitions, inukshuiit played an important role in hunting caribou . The traditional hunting method would be to erect a series of inukshuiit in a funnel shaped pattern narrowing to a dead end on a hillside. The hunters would hide behind the inukshuiit armed with their bows and arrows. The women and children would herd the caribou towards the hunters by waving hides up and down to create loud noises, enabling the hunters to move behind the herd.The inukshuiit would also double as landmarks or cairns (stone piles) identifying the locations of caches of stored meat. Today the inukshuk is used predominantly as a landmark. They can be found scattered across the frozen land. An inukshuk can be spotted from miles away and seasoned travelers can use the inukshuiit as navigational aids. Baffin Island is an Arctic wilderness located in extreme northeast Canada. The island’s northeast coast faces Greenland across the Davis Strait. Its deeply indented coast fronts a tangle of spectacular glacial and ice-capped mountains. There are towers, spires and pyramids of rock and ice, with sheer and overhanging great rock walls. The rock is primarily granite, which provides excellent climbing.